Columbus discovered the hammock in 1493, on the island now known as Puerto Rico. The local Taino people wove their "ah-moks" from the bark of a tree. The Spaniards called it "hamaca" and adapted it for use aboard ships. We call it a "hammock," and the idea is pure relaxation. The Taino people of Puerto Rico were the true originators of hammocks in the Western Hemisphere. 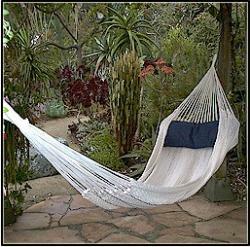 Our Taino hammock is the direct descendant of the originals, updated for modern use. Made of a thicker cable cord, they are the most rugged of all our hammocks. • Rugged without sacrificing comfort. • Durable cotton cable cord. • Four line hammock bed support. • Comfortable hammock for two. • Bed Size: L 7'6" x W 7'6", Over all 13'. We purchased two hammocks from your company the first one purchased in spring is torn already and had to be removed.